My name is Nelma Cummins Martinez. I just ran across your article regarding the New London School Explosion. My sister and two cousins were killed in this terrible accident. Their names are Marcella Cummins, Betty Mussetter Rider and her brother Oliver Mussetter Rider. I was six years old and had just gotten home from first grade when we felt the explosion. My Mother and Aunt took me with them to the High School immediately after the explosion. The building was crumbling as we arrived. This was a horrible sight for a child (or ANYONE) to see. There were parts of bodies lying were they had been blown. There were rows of bodies lying on the ground, some covered, some not. There were hysterical parents, relatives and survivors every where, it seemed. It was hours before we found out that my brother, Earl Dean Cummins, was not been among the dead. He had been helping remove the injured and dead from the ruins (he has since died.) My sister and two cousins funerals were held at the same time in Shawnee, Oklahoma. Gaskill Funeral home held the services. This accident was particularly terrible for my mother because she had just lost my father in an oil field boiler explosion in Andrews, Texas on December 21, 1935. I had nightmares for years, needless to say. I don't know if you will be interested in this bit of information, but I thought I would share it with you. My name is Darlene Lummus. My mother was a student at London School at the time of the explosion. 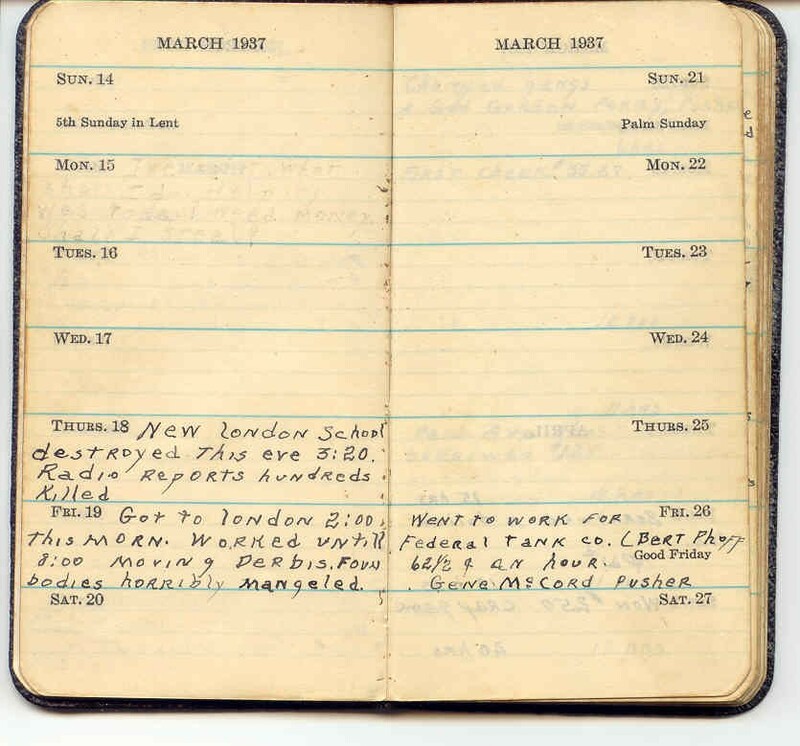 However, she missed just one day from school, March 18. Her mother, a strict disciplinarian, was coaxed by Mother, to let her stay home that day. Mother told me, when she first talked about the explosion when I was quite young, that she had a horrible headache, and my grandmother allowed her to stay home. Mother told me that they lived near the school and when the explosion happended, it shook their house. Granny was terrified as well as my mother. Little did they realize, that the school had exploded. 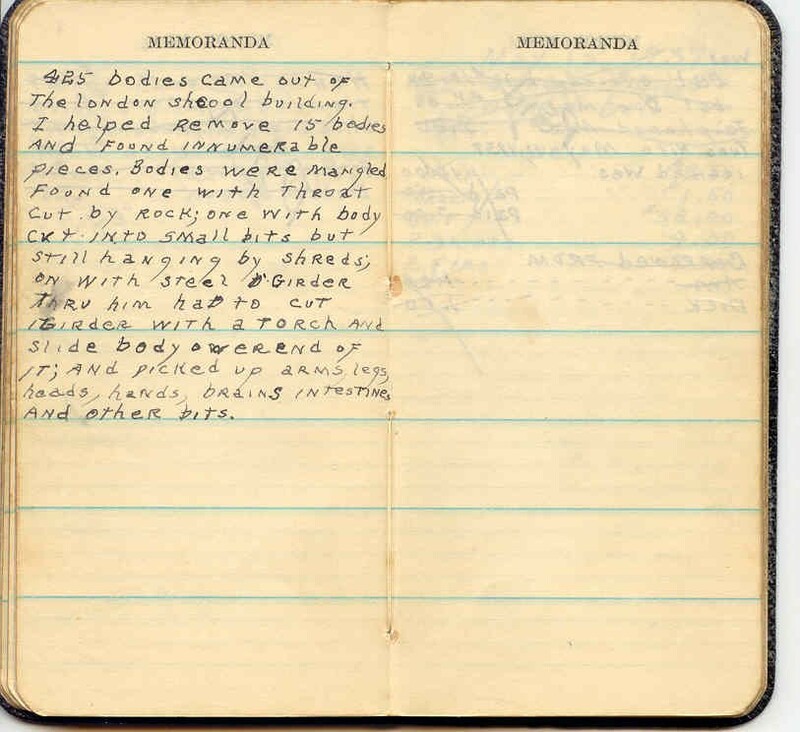 At that particular time, in East Texas, we had a great oil boom beginning...strangers and native East Texas men, their families, etc., were striving to support themselves doing oil well work. As soon as the explosion happened, just shortly, men with trucks, cars, whatever type of vehicles, came to the aid of the school..digging through the rubble, finding both dead and living, but severly injured children, teachers, and visitors. The National Graud was called in, to help with crowd control. At that time, a young cub reporter named Walter Cronkite, was sent to cover the story. His very first story. In nearby Tyler, Texas, a new hospital, Mother Frances, was set to have opening ceremonies the next day. Instead, the doctors, nurses, and whomever else could, rushed to the aid of the hurt, dying and dead children and others. This tragedy, was indeed, the worst ever in the State of Texas, and other states. The school even got a telegram from Germany by a fellow by the name of Adolph Hitler. Thank you so much for reading this. I know a lot of it is probably reparations of stories you may already have. I do this to honor my Mother. Had she gone to school that day, she would have died, and not been the world's most perfect mama to 6 very active children. My grandfather was working the oil fields of East Texas (my mother was born in Overton) when the explosion occurred. In a "give-away" calendar book, he keep as a diary, he recorded comments and specifics regarding what occurred. He heard about it on his car radio and immediately drove to New London and helped with removing the bodies. He describes in rather graphic fashion the handling of bodies and parts during this time. He notes that 425 bodies were counted, but I know the numbers vary depending on the source. His name was James (Jim) H. Hicks and he passed away in 1982. There are other miscellaneous details in the book concerning his activities that year. It is interesting to note that he went to work the next week for 62.5 cents an hour, and later his first check on Apr 5th was for $35.27. On the Saturday, Apr 3rd, he worked 20 hours, and sometime during the day, won $2.50 in a crap game. Some of his entries were made in pencil and have faded.